Voted the 41st greatest film of all time in the 2012 Sight & Sound Critics poll. 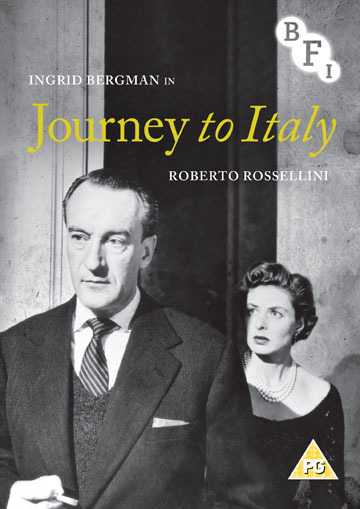 A well-to-do married English couple travel to Naples after inheriting a villa, Alex (George Sanders) a workaholic businessman and Katherine (Ingrid Bergman) a more sensitive character. With a loveless relationship the couple are on the verge of a divorce and decide to spend the remainder of their trip separately. Katherine visits museums and historical sites, while Alexander goes to Capri to relax with drinks. Their separation allows them to grow and revisit the past and ultimately begin to become intrigued again with one another, a delayed anti-honeymoon. Poorly received on initial release, the film feels eerily modern due to its timeless themes of the unwelcome intrusion of the past and the terrifying uncertainty of the future, both reccurring in Rossellini's work. Ranked 39 in the Sight and Sound's 'Top 50 Greatest Films of all Time' the film has recently received the recognition it deserves, with Martin Scorsese even making his own film My Voyage to Italy, exploring Italian cinema in general and the film's impact on his work.